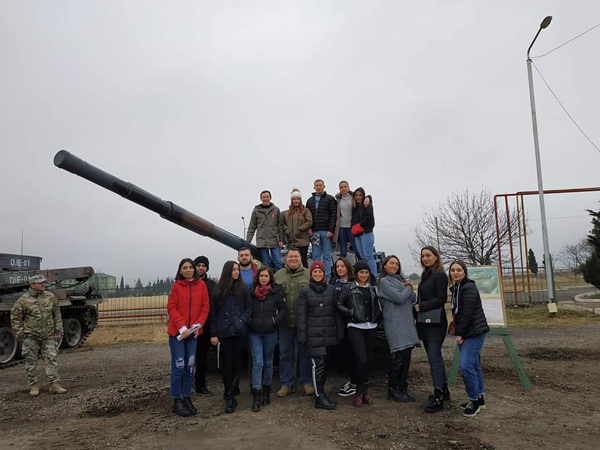 Guram Tavartkiladze Tbilisi Teaching University, Business Administration and Social Sciences Faculty, Journalism Specialty students within the framework of the journalistic master workshop ("Extreme Journalism"), visited the 4th Mechanical Brigade of the Ministry of Defense at the Vaziani military base. During the field lecture, accents were made on combat techniques and weapons. The future journalists looked at the simulation center. Students of extreme journalism and news journalism were acquainted with the specifics of preparation of reportage and safety rules in combat situations.